/Comedy, /France, 1979, 100 min. 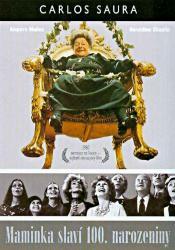 Synopsis Ana is alive and married with Antonio; they arrive in the manor in the countryside of Spain where she worked as a nanny many years ago, for the centennial birthday of the matriarch. In their reunion, she finds that Jose died three years ago; Juan left his wife Luchy; Fernando is still living with his mother and unsuccessfully trying to fly a hang glider; and the three little girls are grown-up. Further, she discovers that the dysfunctional family is completely broken, and Luchy in embezzling mother's money. When Juan arrives for the celebration, he plots with Fernando and Luchy to kill the mother to get the inheritance. Meanwhile, Antonio has a brief affair with Natalia.